New York-based Shen Yun Symphony Orchestra, which blends the spirit of Chinese music with the power of a Western orchestra, will launch its first Asian tour this year, delivering 18 performances in Japan and Taiwan, from Sept. 15 to Oct. 3. Tickets went on sales on July 1. This is exciting news for Shen Yun fans who have been waiting for years for such a tour. New Tang Dynasty (NTD) Television Hong Kong Branch has also issued an invitation to the Shen Yun Symphony Orchestra to perform in Hong Kong, this October. Ancient Chinese instruments like the two-stringed erhu and the plucked pipa, and a range of Chinese percussion instruments combine with those of a full Western orchestra – strings, woodwinds, and brass – creating a refreshing, new sound. This year will be the orchestra’s first tour to Asia. NTD Television Hong Kong Branch Manager Zhu Changmin said, after the Shen Yun Symphony Orchestra tickets went on sale on July 1, in Taiwan, the demand for tickets has been increasingly high. More than half of the tickets for performances in East Taiwan were ordered (in pre-sale), even before going on sale. 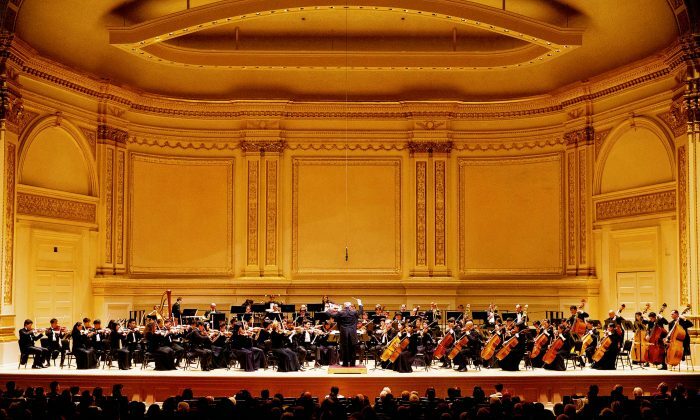 Shen Yun Symphony Orchestra has performed at world-renowned theatres including the New York Carnegie Hall, the San Francisco War Memorial Opera House, the Los Angeles Dolby Theatre, the London Royal Festival Hall and the Vienna City Theatre. The orchestra mostly performs Shen Yun original compositions, as well as a few classical masterpieces by famous composers such as Beethoven, Tchaikovsky, Rimsky-Korsakov and others. Many famous musicians have been deeply impressed by the show. Toronto Symphony Orchestra conductor Kerry Stratton said the conductor, Milen Nachev, faces the challenge of balancing the two types of instruments while avoiding having the Western instruments drown out the Chinese instruments. “They (Chinese traditional instruments) are very subtle instruments so you cannot overwhelm them. But they’ve solved this balance problem very well. To combine that sound—that very ancient sound with the more modern, let’s say, Western orchestral sound—is a challenge that they’ve met, they’ve met very well,” he said.